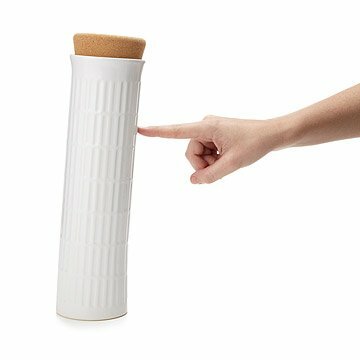 Store your spaghetti in this playful ceramic canister shaped like the leaning tower of Pisa. Buon appetito! This delicious pasta keeper lets you enjoy your spaghetti with an Italian flair, even before the water boils. Inspired by the iconic bell tower in Pisa, it helps to keep your noodles dry and unbroken. The cork cap even holds an ingenious way for you to measure portion sizes--rest the tips of the noodles into one of the three inset circles for 1-3 person servings. Made in China.